I love the new yahud-fl blue. Can anybody possibly lead me to a solution to make the reserved ammo color blue? I prefer this shade of blue with this html notation: 077df9. "ya_AmmoReserve" "227 227 227 255"
"ya_AmmoReserve" "7 125 249 255"
instead of having the stretched out skulls, i want to put a block on top when dead, how to do that? Hergan5 Amp-tHey does anyone know how to add a marked for death icon ? You will need to add this code to the end of hudplayerhealth.res "PlayerStatusMarkedForDeathImage"
Yo can anyone tell me how i can make my scoreboard show more players? Currently it is 6v6 but i wanna make it show 16 players each team. TimoYo can anyone tell me how i can make my scoreboard show more players? Currently it is 6v6 but i wanna make it show 16 players each team. Increase the tall value for RedPlayerList and BluePlayerlist in scoreboard.res. Might have to move some other things depending on the scoreboard to accommodate the increase. [quote=Timo]Yo can anyone tell me how i can make my scoreboard show more players? Currently it is 6v6 but i wanna make it show 16 players each team. nokk TimoYo can anyone tell me how i can make my scoreboard show more players? Currently it is 6v6 but i wanna make it show 16 players each team. Thanks Increase the tall value for RedPlayerList and BluePlayerlist in scoreboard.res. Might have to move some other things depending on the scoreboard to accommodate the increase. [quote=nokk][quote=Timo]Yo can anyone tell me how i can make my scoreboard show more players? Currently it is 6v6 but i wanna make it show 16 players each team. Oh yeah haha. I just assumed he wanted to make the 6v6 version be 16v16 instead. can someone get me this hud ? mousiopecan someone get me this hud ? [quote=mousiope]can someone get me this hud ? "fgcolor" "0 0 0 0"
How do i move the black background behind the individual charge meters? It's in hudmediccharge.res called IndividualChargesLabelShadow. Im using broeselHUD and was wondering if I can move the floating damage numbers up and to the right a bit from where they usually pop up. How do I change the overhead health text of an ally back to the default cross? I don't know that to look for. TheMann88888888How do I change the overhead health text of an ally back to the default cross? I don't know that to look for. If you're talking about the floating health numbers, there's an option to go back to the old stlye in Advanced Options. That or type tf_hud_target_id_disable_floating_health 1 in console. 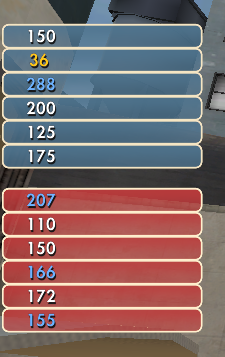 On a side note, does anyone know what is making the class icons in the mvm wave panel so white? Edit: figured out what was making the class icons white, also figured out what res files affect the wave display, but none have minmode values in them. Does it have something to do with the default files? Can you change console history text color besides text that you have typed yourself? Can you change the console default position/size? Can you add a border to the server browser, console, and options panels? Can you change the background of the options keyboard tab background (where the key bindings themselves are)? Can you change the achievement panel's achievement list colors (in particular the background that exists around the picture and the show achievement on HUD text)? Can you change (remove/add/move) buttons on the main menu using minmode? How do I make the default backgrounds square instead of the weird shape they are? I can tell you that you can't change buttons on the main menu with minmode, specifically because the main menu can't hud_reloadscheme, which minmode essentially does. I'm not at home right now so I can't go through the console stuff, but I'm fairly sure it's all possible, other than the position/size of the console. Thank you. That means the only way to change things on the main menu is with the OnlyInGame and OnlyAtMenu commands, correct? Related to that, can you use those commands on non-buttons (editablepanels, labels, etc.)? Stochast1cThank you. That means the only way to change things on the main menu is with the OnlyInGame and OnlyAtMenu commands, correct? Related to that, can you use those commands on non-buttons (editablepanels, labels, etc.)? From my experience, no. But you can use those buttons to replace things like backgrounds and text, by adding a blank font (AdobeBlank is a good choice) and having the "command" be "echo". I found that not having a command on buttons that you only want to show at menu/in game tends to make them not show up properly. "defaultFgColor_override" "0 0 0 0"
"armedFgColor_override" "0 0 0 0"
"depressedFgColor_override" "0 0 0 0"
If you need a hand with anything else to do with those kinds of things, let me know.